The BP disaster in the Gulf of Mexico that began on April 20, 2010, was a wakeup call for all of us as Americans as we weigh our country’s energy future. In what way? It’s because we Americans have consumed most of our “easy” oil. Like a drug addict who desperately takes more chances as he has to have more of his drug of choice than he can afford, we are willing to take more and more chances as we drill for the “hard” oil in more and more fragile and risky environments. In the BP Gulf disaster, strongly motivated by profit, BP was willing to risk drilling in super–deep water to maintain profits even though they had no idea what they would do in the worst–case blowout. As a result, eleven people died, and the nation watched in horror for three months as a total of about 180 million gallons of oil spewed into the warm, then life–rich Gulf waters, leaving a large area around the spill essentially shut down for all economically productive activity for months. The most authoritative studies of oil recovery and degradation by the National Oceanographic and Atmospheric Administration (NOAA) and the Woods Hole Oceanographic Institute estimated that only 20% of the oil evaporated or was collected, leaving the rest of the spill floating around in the Gulf (Science News, August 19, 2010). According to Congressional testimony by Florida State ecologist Ian MacDonald, the oil will “likely remain harmful for decades,” and may continue to make some areas of the Gulf uninhabitable by any life–forms. The Obama Administration now has to decide if it will allow Royal Dutch Shell to drill in the Arctic Ocean this coming summer—Shell was planning to begin exploratory drilling in summer of 2010, but the BP spill put at least a temporary hold on that plan. Sound familiar? Try this one on for size. The risk of spills is based on spill statistics derived from data from other regions of the country. No allowance at all is made for the response gap—period of days, weeks, or months when weather and/or ice conditions preclude any spill response whatsoever. No allowance has been made for the fact that extreme climate change, in this case the world’s highest amount of winter warming in recent decades, has already restructured the ecology of the Arctic Ocean, and thus compounds the difficulty of establishing a benchmark for species to measure impacts against in the case of a spill. Blowouts like that of the BP Deepwater Horizon and also the 2009 Montara blowout near Australia both occurred during the exploratory drilling phase, what Shell is proposing. Bowhead whales (Balaena mysticetus), which are essential to the Iñupiaq diet, culture, and social and psychological well-being, are especially vulnerable to oil spills. Yet federal environmental impact studies give short shrift to these major social and environmental impacts. The use of dispersants, oil burning, booms, and some other commonly–employed oil–removal technologies are much less effective in cold, icey Arctic waters than elsewhere in the country. The Alaskan Arctic area lacks adequate infrastructure such as roads, ports, and major air strips which will complicate any effort to get the needed equipment to the spill site. The Shell plan assumes that the ship having a blowout will drill its own relief well. This has never happened for a blowout anywhere else. The plan assumes a worst–case blowout of no more than 5,500 barrels per day. Another Beaufort Sea development project posits that up to 20,000 barrels/day could be expected, in their case. Environmental changes that may be regarded as minor elsewhere have significantly influenced the physical and cultural dimensions of life in the Arctic, and are directly threatening indigenous populations. Around the time when oil was discovered in Alaska’s North Slope, the people began to recognize various changes in their land, sea and atmosphere that had been unprecedented. The whaling crew led by Arnold Brower Sr. landing a bowhead whale, Point Barrow, Alaska, May 2005. Photo by Chie Sakakibara. However, their greatest challenges are yet to come as the mass of the sea ice decreases, high waves erode their land, and climate change increasingly begins to interfere with their northern homeland. An Iñupiaq saying goes “God chose to place us in the harshest environment in the world,” which implies their keen awareness of their traditional adaptability and flexibility cultivated over years. They are indeed the proud residents of the “Top of the World.” They have called the Arctic Ocean their “garden,” and sustained their relationship with marine mammals for millennia. Today, on the top of the world, however, the Iñupiat are literally standing on the northern frontline of global climate change. Global sea levels are now rising nearly one–third of a centimeter every year, driven by melting glacier ice and the thermal expansion of ocean water as it warms, inundating the majority of coastal communities in northern Alaska. In addition to ongoing erosion that forces the villagers to relocate, the biological response to climate change also takes place in the Arctic; not surprisingly, the Arctic is now warmer and greener. Exotic southern creatures have begun migrating to the North, gradually invading the territory of northern species. The sighting of unfamiliar species and changes in migration patterns of animals–particularly the bowhead whale and caribou—give them a strong sense of uncertainty and crises. The loss of ice and the change in the whales’ migration route to the north undoubtedly influence the subsistence whaling practice, the foundation of the Iñupiaq worldview. The Arctic Ocean has been a center of international attention especially since the second half of the 19th century. The commercial whalers initially arrived in the Arctic around this time following the migration of the bowhead whales. The bowhead whales were constantly sought after because of whale oil available from their thick blubber (Muktuk in Iñupiaq) and the baleen plates attached to the upper jaw of the whale. Almost all lamps and street lights around the world were fueled by whale oil before the invention of electricity, and whale oil also lubricated weapons and automobile and bicycle parts. Whale oil became the major ingredient of soap, candle, pomade, and various cosmetic items. The baleen plates were transformed into corsets, umbrella bones, along with many other necessities in the Euro–American living–standard. By the 1920s, the population of the bowhead whale was decimated by incessant commercial whaling. Today, it is ironic that world attention is on the Arctic once again for oil—not whale oil anymore, but for petroleum that lies beneath the Beaufort and Chukchi Seas. Worse yet, climate change and reduction of sea ice fuel the ambition of oil companies. The combination will undoubtedly impact the largest resident of the northern seas: the bowhead whale. 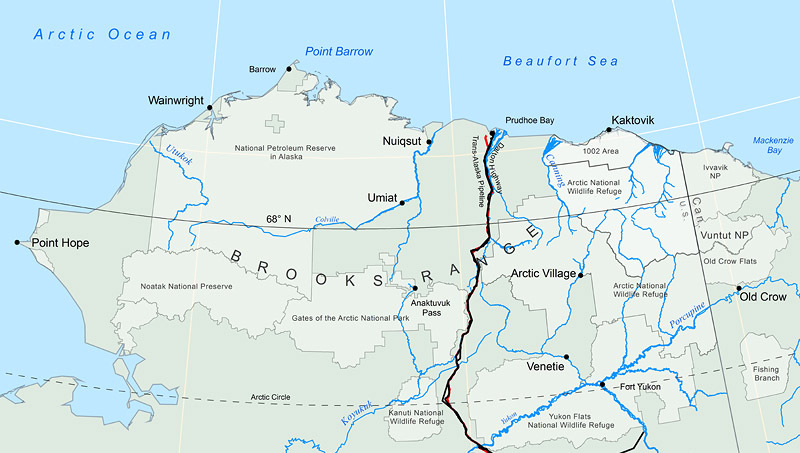 Map of the North Slope of Arctic Alaska. Courtesy Chris Badurek, Appalachian State University. In July 2009, the rumor of an oil spill in the Chukchi Sea spread like wildfire in Barrow and Wainwright, two North Slope communities. “Something big and strange is floating through the Chukchi Sea between Wainwright and Barrow,” said Harry Brower, Jr., who witnessed a huge blob of Arctic goo from an airplane one evening. Many other passengers saw the mysterious substance from the air, and the level of suspicion kept growing that an oil company had secretly conducted oil extraction or seismic testing which might have resulted in the oil spill. Seal hunters from Wainwright initially witnessed the layer on the sea in early July, and the thick, brown–black, “gooey” substance with an odor eventually covered the offshore area between the two North Slope villages for 90 miles. The villagers constantly exchanged sighting information via the VHF radio, sent out the North Slope team in a borough helicopter to shoot video from the air, collected samples for testing, and sent a report to media. Although it was eventually concluded that the goo was a non–oil product, perhaps a hazardous substance, the origin of the gunk remained uncertain. It could well be a “big algae bloom or any kind of natural phenomena” as a Coast Guard official suggests, but the consensus among the villagers was that nobody in Barrow or Wainwright had seen anything like it in the past. Across the Arctic coast, false reports of oil spills are filed often. This semi-hysteria experienced in the Barrow and Wainwright communities reveals how villagers are concerned about the potential damage that offshore oil extraction may bring upon their habitat. There has been an extreme sense of oilphobia shared among indigenous peoples of the Arctic, especially after the Exxon Valdez spilled 10.9 million gallons of crude into Prince William Sound in 1989. The communities around the Sound suffered from depression, increased domestic violence and drug abuse throughout the following decades as a result of being deprived of their access to the sea. Twenty years later, the impact of the tragedy haunts the people and their homeland—the Pacific herring, a foundation species for that region, has permanently disappeared; other species such as the harbor seal, Harlequin duck, the loon, cormorants and pigeon guillemot have declined and not recovered. On the surface, the beach seems to have recovered fully from the disaster. But one scoop of the surface reveals the reality of the lingering depth of damage that is still clearly visible in the sticky black gunk that clings to the shovel. To many, black color of crude oil is the color of death, the color of absolute lifelessness, silence, and hopelessness. Then the BP oil spill brought a catastrophic outcome to the environment and the people who live in the southeast coast of Louisiana. Through media reports, the Iñupiat witnessed how the people in the south suffer from the fishing ban due to potentially contaminated food, lost income and the profound disruption of a traditional way of life. Now at the end of 2010, the Arctic region is forced to confront this issue all over. Undoubtedly, drilling will impact the survival of the bowhead whale and other Arctic species including the polar bear, beluga whale, walrus, bearded seal, ice seal, ribbon seal, fur seal, salmon and 150 other fish species, migratory birds, and countless other species already stressed by climate change. As much as the bowhead whale is endangered, so are the indigenous peoples. “We are endangered species called the Iñupiat,” said Earl Kigik of Point Hope. Any drilling has to be preceded by an “environmental assessment,” i.e., the Arctic Ocean outer continental shelf seismic surveys administered by the Bureau of Ocean Energy Management, Regulation, and Enforcement (BOEMRE, formerly called the Minerals Management Service). The testing usually takes place in the short Arctic summer and early fall when the sea ice recedes the most. The bowhead whale is known for its sensitive ears, and most likely seismic surveys disrupt their migration patterns immediately before the fall whaling time. 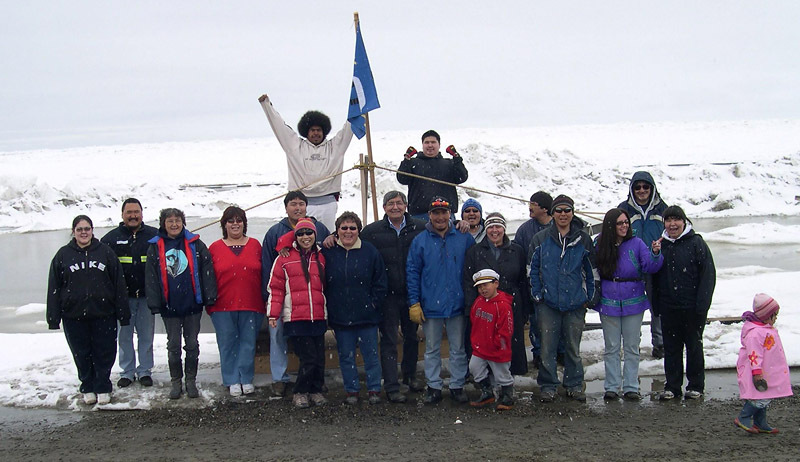 The whaling crew led by Julia and Jeslie Kaleak, Sr. of Barrow hosting Nalukataq, June 2005. Photo by Chie Sakakibara. In 2009, this sense of crisis and urgency brought the Iñupiat of the North Slope Borough and the Northwest Arctic Borough to co–organize the Arctic Economic Development Summit in Point Hope with the slogan of “Two Regions, One People: No Boundaries.” Throughout the summit, Iñupiaq whalers and oil–company executives gathered to express very different viewpoints on whether or not there should be oil exploration and development in the Chukchi Sea. Public hearing sessions of resource extractions are always well–attended across Iñupiaq country, and often these sessions are emotionally charged. The following section reveals the voices and sentiments shared by our Iñupiaq collaborators in Barrow and Nuiqsut, Alaska in the last several years. In August of this year, my student team from Appalachian State University and I (Harvard) interviewed several whaling captains in Barrow. These interviews covered the life–histories of these whalers, and included their stance on offshore drilling in the Arctic Ocean. They ranged from their 20’s to their 80’s—one commonality was that each of them began whaling around 10 years old or younger. In addition, I refer back to an interview conducted in 2007 in Nuiqsut, Alaska, which was published in a recent book I co–authored with Landon Pennington, and Dave Harman titled, Arctic Gardens—Voices from an Abundant Land. Ben Nageak is a 60–year–old whaling captain who served as mayor of the North Slope Borough the highest office of Iñupiaq society—from 1996 to 1999. He is widely traveled, representing the Iñupiat in international meetings dealing mainly with game–animal treaties, and he lived for two years in the Lower 48. He took the lead in insisting that the Iñupiat have a first–rate scientific team to study Arctic ecology, especially that of the bowhead whale, which they have in fact had for about 30 years. Harry Brower is a 52–year–old Iñupiaq whaling captain who is serving as the Chairman of the Alaska Eskimo Whaling Commission, which represents all the Iñupiaq whaling captains on the North Slope in addition to Yup’ik whalers further south. As such, he travels the world representing indigenous whalers—most recently he has traveled to the United Nations Climate Change Summit in Copenhagen (Cop 15) in December, 2009, and to Morocco for the annual International Whaling Commission meeting in July, 2010. Is our addiction to petroleum going to drive us Americans to deprive an ancient Native culture of North America, the Iñupiat, of their heart and soul? Are our Suburbans, our Yukons and our Hummers going to demand it? Our addiction has consequences. 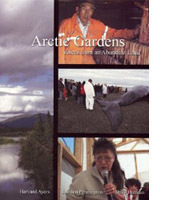 Harvard Ayers is a Professor Emeritus of Anthropology at Appalachian State University and is Senior Author of “Arctic Gardens—Voices from an Abundant Land”, published in 2010 by Arctic Voices, a non–profit publisher. Earlier, in 1998, he was Senior Editor of “An Appalachian Tragedy—Air pollution and Tree Death in the Eastern Forests of North America”. Chie Sakakibara is an Assistant Professor of Geography in the Department of Geography & Planning at Appalachian State University. She has been exploring cultural adaptation of the Iñupiaq people to climate change in the North Slope Borough of Alaska since 2004. She is an adopted member of two whaling crews in Barrow, Alaska, where she calls home.